For decades, low-skilled and unskilled immigration into the United States has surged, depressing wages and harming America’s most vulnerable citizens. On average, 1 million immigrants are accepted into the United States for legal permanent residency annually, and most of them are low or unskilled workers [emphasis added]. For 88 countries of origin, the percentages of skilled workers exceed the rate for the total US-born population. For 66 countries of origin, the percentages of skilled workers are higher than the percentages for any US state. The percentages of skilled workers from Canada (60 percent), Europe (51 percent), Asia (52 percent), Africa (51 percent), and Oceania (52 percent) are higher than the percentages of skilled workers from any US state. The term “skilled workers” is defined in the next section. Also, all of the estimates described subsequently are for the population 16 and over. The percentages reported here are the ratios of skilled workers to either the legally resident foreign-born population or the US native-born population. For example, the 2015 American Community Survey (ACS) counted 7,643,000 people who were born in Ohio (Table 1). About 3,088,000 of them were skilled workers. Thus, 40 percent of the population born in Ohio were skilled workers. 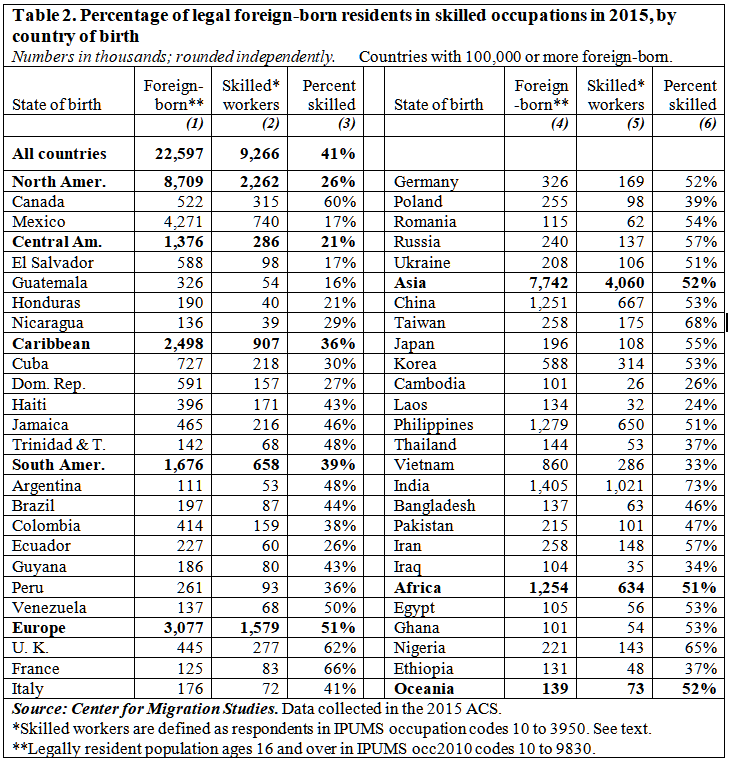 Similarly, the 2015 ACS counted 396,000 people who were born in Haiti (Table 2). About 171,000 of them were skilled workers. So, about 43 percent of those born in Haiti were skilled workers. The term skilled workers, as used in this paper, refers to the total number of workers in the occupations listed below. These occupations were chosen because many of them require advanced degrees and training. Other occupations, such as educators, health care workers, and workers in protective services, also require extra training, and these workers make significant contributors to the public good. The major occupational categories are in bold, followed by examples from the full list of occupations. Executives, managers, and business operations. Chief executives, business managers, compliance officers, management analysts. Financial specialists. Accountants, auditors, budget analysts, tax examiners, and revenue agents. Computer and mathematical. Computer scientists, systems analysts, software developers, database administrators, statisticians. Architecture and engineering. Architects, aerospace engineers, chemical and civil engineers, industrial engineers. Technicians. Engineering, surveying, and mapping technicians. Life, physical, and social science. Agricultural, biological, and medical scientists, economists, psychologists. Community and social service. Counselors, social workers, clergy, directors of religious activities and education. Legal. Lawyers, judges, magistrates, and other legal support workers. Education, training, and library. Teachers at all levels, archivists, curators, and librarians. Arts, design, entertainment, sports, and media. Artists, athletes, musicians, editors, reporters, technical writers and authors. Healthcare practitioners and healthcare support. Physicians, surgeons, nurses, emergency medical technicians and paramedics, optometrists, and therapists. Protective services. First-line supervisors, firefighters, sheriffs, police officers, security guards, detectives. The percentages of skilled workers are based on data collected in the Census Bureau’s 2015 American Community Survey. The unique feature of these estimates is that undocumented residents have been removed from the overall foreign-born population, leaving only the legally resident foreign-born population. These percentages make it possible to directly compare the percentage of skilled workers in the legally present foreign-born population, by country of origin, to the percentage of skilled workers in the native-born population, by state of residence. This paper excludes the undocumented because it addresses the president’s criticism of the legal immigration system. Given their wide range of demographic differences, it is likely that these immigrants acquired their skills in a variety of places and under different circumstances – some in their home country and some after arrival in the United States. Despite these very different circumstances, however, the legally present foreign-born have the same percentage of skilled workers (41 percent) as does the US born population. A total of 66 countries produce percentages of skilled workers higher than any US state. The individual comparisons shown here are based on sample data and thus are subject to sampling error. However, the legally present foreign-born populations from all of the countries and states shown here are larger than 100,000, so sampling variability should have very little effect on the results. The White House has suggested that the US legal immigration system lowers the skill level of and otherwise burdens the US population. The data presented here – which demonstrates that legal immigration has produced the same percentage of skilled workers as in the native-born population – should put that canard to rest. The paper also illustrates that legal residents from many of the countries the president has derided – particularly Haiti and African nations — have higher percentages of skilled workers than the US-born native population. White House fact sheet, “President Donald J. Trump Backs RAISE Act,” issued August 2, 2017. https://www.whitehouse.gov/briefings-statements/president-donald-j-trump-backs-raise-act/. Estimates of the legally resident foreign-born population were computed by subtracting CMS’s estimates of the undocumented population in 2015 (counted in the 2015 American Community Survey (ACS)) from the total foreign-born population counted in the 2015 ACS. 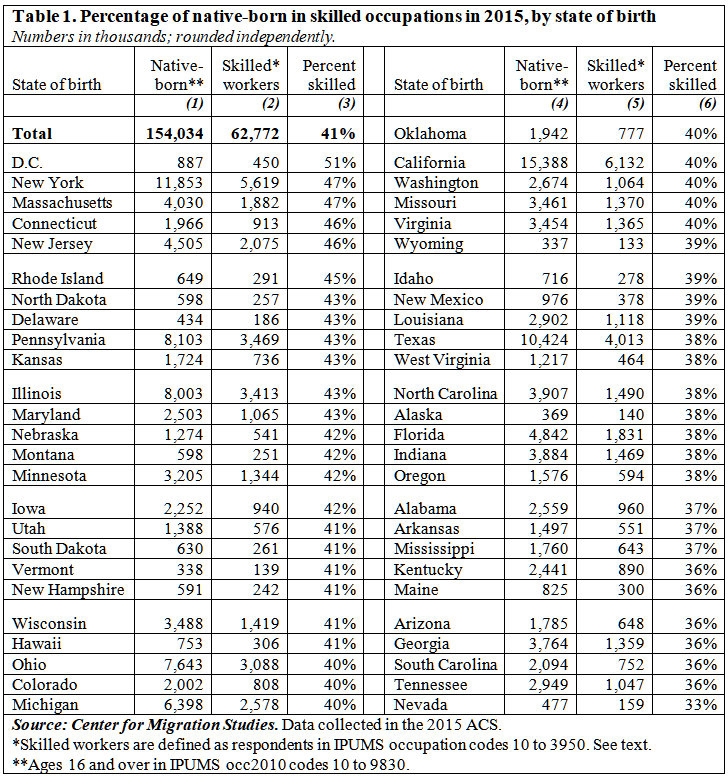 Undocumented residents were subtracted from the total count of states and individual countries, as well as from the count of skilled occupations. The CMS methodology used to estimate the undocumented population is described in detail in Warren (2014). That is, 7,643,000 in ages 16 and over with an occupation. Technically, skilled workers, as defined here, are in occupation codes 10 to 3950, Occupation basis 2010 in the 2015 ACS. Source: See footnote 5. Source: Steven Ruggles, Katie Genadek, Ronald Goeken, Josiah Grover, and Matthew Sobek. Integrated Public Use Microdata Series: Version 6.0 [dataset]. Minneapolis: University of Minnesota, 2015. http://doi.org/10.18128/D010.V6.0.